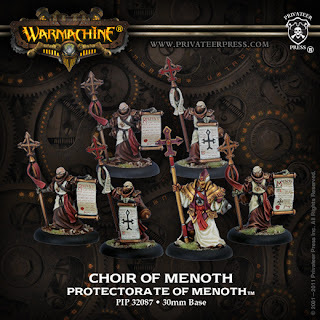 The Protectorate of Menoth is the easiest army to expand upon as there are a couple of choices that are considered ‘don’t leave home without them’ units. Out of the box the Menoth forces get you to 21 points, just short of the magic 25 point goal so it won’t take much to make them a truly holy fighting force. The first things you’re going to want to add are some units, Menoth already has three Warjacks so taking units means your focus isn’t going to be spread too thin and also means you can spread out over the battlefield giving you more tactical options. The cheapest and simplest addition to any Menoth army is the Vassal. 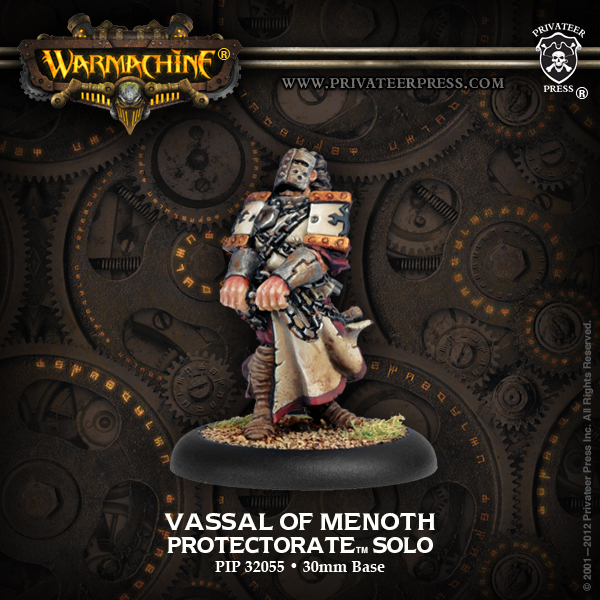 A vassal is only two points but is a staple of the Menoth army. Not only does he have a substantial offensive spell but the addition of +2 armour and defence to any warjack he is in contact with is quite hefty boost. An extra two points might not seem like much but add that to a heavy warjack and its armour becomes an eye watering 21 and two points less damage goes a long way. Not only is this useful little gentleman a cheap points addition to your army, he’s also a nice low cost model to expand your army without breaking the bank. Considered by many to be the most important unit in a Menoth’s army, the Choir adds friendly bonuses to a chosen Warjack with their magic hymns. On their own they are soft and squishy so you’ll want to keep them away from any rampaging warjacks but use them as support to your Warjacks and suddenly Menoth’s steam powered killing machines become a lot more powerful. The battle hymn adds a rather nice +2 bonus to attack and damage roles for a turn, whereas the passage and shielding hymns both protect your warjack from specific attacks. 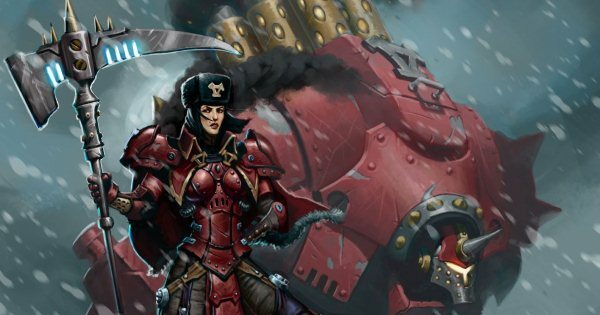 Khador relies on brute strength and heavy armour and because of this they field only heavy warjacks. 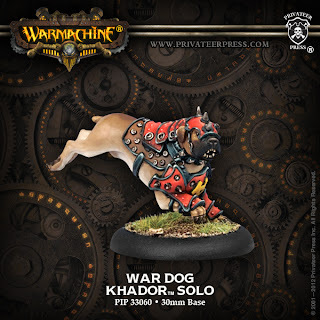 The Battle box brings you to 20 points and with most Khador warjacks being in the 7 to 9 point range you’ll be hard pressed to bring a third warjack to the table. Like the Vassal for Menoth the War Dog is a nice cheap addition to any Khador force. 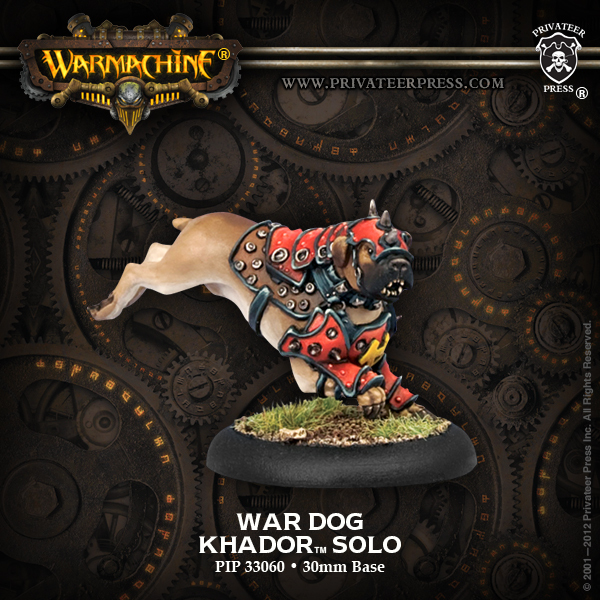 The war dog offers a bit of protection for your Warcaster as well as some close range offensive options. Admittedly Sorccha isn’t in desperate need of protection but this is your Warcaster we’re talking about, let them die and its game over; literally. 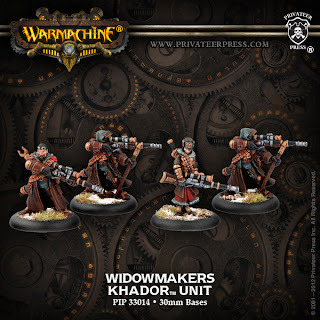 Khador are all about getting up into your grill and pounding stuff into the ground. Exclusively using heavy warjacks all with high armour values is the sledge hammer of the Khador army. Every now and then you need a bit more precision, a surgeon rather than a butcher. 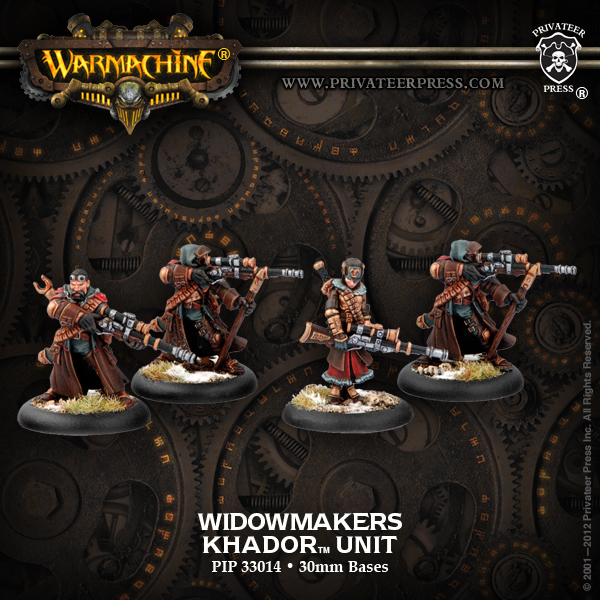 The surgeon of the Khador army is the Widowmakers; a team of snipers ready to take out key opponents from a distance. Camouflage, advanced deployment, pathfinder and the sniper ability means that the Widomakers can get where they need to be and start harassing the enemy. It’s the perfect support for your heavy jacks, giving the opportunity to target tricky enemy support or just soften up the opposition until the ‘jacks get into smashing range.